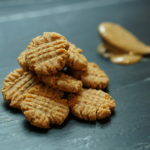 Chunky, smooth, swirled with sugar free jam; no matter how you enjoy it, peanut butter is a fan favorite! We took Grandma’s classic cookie and brought it up to Keto SPEED! Chewy and delicious, these treats are perfect for sharing! 1. Combined all ingredients and mix until dough has formed. 2. Roll into tablespoon size balls and place on baking sheet lined with parchment paper. 3. Flatten cookies by making a crisscross mark on top of cookie with a fork. 4. Bake at 350F for 15-17 minutes, or until the edges are golden brown. This recipe is PERFECT to make with your children! Share a picture to Facebook or Instagram of you making these cookies, tag us @justpruvit #ketocooking! What is your favorite classic cookie? Did you make it Keto Friendly?! Send us your favorite Keto Recipes to YUM@Pruvithq.com, we’ll share it on our blog!